Bradley Cooper, Emma Stone, Rachel Mc Adams, Bill Murray, John Krasinski, Danny Mc Bride, Alec Baldwin, Bill Camp, Danielle Rose Russell. With a title like Aloha, it is obvious that this is going to be a Hawaiian story. But, not quite in the way that might have been anticipated. This is a film written and directed by Cameron Crowe, a former journalist for Rolling Stone magazine, specialising in popular music – and the film version, somewhat autobiographical, was in Crowe’s film, Almost Famous. Other films by Crowe include his most famous, Jerry Maguire, as well as The Vanilla Sky and Elizabethtown. Crowe is interested in relationships and these are to the fore in Aloha. However, he includes a more contemporary theme, space exploration – and the exploitation of space for communications as well as for military defence. The film has a very good cast, led by Bradley Cooper as Frank who has emerged as a significant actor with such films as Limitless, American Heist, The Silver Linings Playbook, American Sniper. The leading lady is Emma Stone, Magic in the Moonlight, Birdman. He plays a scientist with a knowledge of technology and who has served on being wounded in Afghanistan. She plays a captain, a fighter pilot, Allison Ng, who reminds everyone that she is one quarter Hawaiian. Their paths cross when he is invited to Hawaii by a billionaire entrepreneur, played by Bill Murray, who wants to send up a satellite, privately financed, but in collaboration with the American military, but needs permission from local Polynesians, especially from the King and his kingdom, for a blessing of a bridge and permission for the satellite to go up into the Hawaiian sky. The personal story is complicated because Frank encounters his girlfriend of 13 years earlier, a woman who was in love with him but whom he stood up. She is Tracy, played by Rachel Mc Adams, who is now married to a rather taciturn pilot, Woody, John Krasinski. The past lovers renew acquaintance, Tracy having the need to vocalise her feelings of the last 13 years, Frank being forced to acknowledge what he did in the past, with Allison witness to this. Tracy has two children, Grace and Mitch, who contribute to the plot complications. Allison herself has become involved with Frank and believes that his work is to help the entrepreneur put a satellite in space which has nothing to do with military or defence. She experiences some disillusionment with him, but the situation makes emotional and loyalty demands on Frank as to what he really believes in and whom he loves. And In the background are military officials played by Danny Mc Bride and Bill Camp, liaisons with the general, a crusty character, played by Alec Baldwin. Cameron Crowe is a liberal at heart and this is the perspective that pervades the final part of the film. 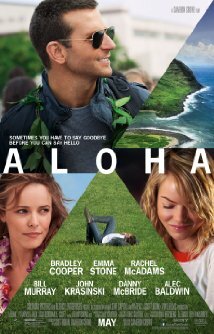 A blend of the light and the serious with attractive Hawaiian and locations and an interesting cast. 1. The story, characters, issues? 2. The locations, Oahu, Honolulu, Waikiki, the countryside, roads, mountains, the Kingdom village? 3. The director, his films, his journalist background, popular music, the range of songs, the score? 4. The title, its use, greeting, meaning? The references to Hawaiian mythologies, the sky, premonitions, burying the dead, divinities? The stories and their effect? Mitch and his interest and books? The response of the US sceptic and rationalist? 5. The film as a romantic story, as a space story, combined themes? 6. The introduction, the history of Hawaii, the 1950s, the 49th state, the media clips? 7. Bradley Cooper, Frank’s story, military background, in Afghanistan, Kabul, his being wounded, the response, the role of Carson Welch, abandoning Frank? The new mission? Frank’s response, coming to Hawaii? His science and technological skills? 8. Frank as a person, his age, experience, his memories, childhood and science, astronomy? His training? Cynical? Motivation for his involvement in the scheme? 9. Allison, pilot, her age, experience, a quarter Hawaiian, brisk, the questions, uniform? Her reaction? Frank and his reticence? The phone call to her mother, describing Frank? Her job, his not wanting to socialise? The plan for the ceremony at the bridge? Travelling with Frank to the Kingdom, meeting the King, the other Polynesians? Her getting the King’s favour, playing the guitar, singing? The effect of being with Frank? The kiss, the relationship? Discovering the truth about Welch, her sense of betrayal? 10. Allison, friendship with Tracy, with the family, helping the children, Grace and the hula, Mitchell and his investigations? Allison as a person? 11. Tracy’s story, her love for Frank, 13 years absence? Her love for Grace, for Mitch? Her love for Woody, marrying him? His work as a pilot, bringing in Frank? The invitation to the house, the meal, and to the club? Tracy wanting to talk about the past? The tension with Woody, his silence? Her decision to leave? Woody leaving? The humorous perspective of Woody and his putting his hand on Frank’s shoulder and Frank interpreting the whole conversation? The later conversation and the subtitles? Woody acknowledging that Grace was Frank’s daughter? 12. Carson Welch and his background, wealth, entrepreneur, the point being made about private enterprise involved in space exploration, satellites? No government control? The military and their decisions? The general, the other assistants? Welch and his patriotism, against the Chinese, the defence of America, Chinese hacking? Weapons in the satellite? 13. Welch as a person, his relationship with Frank, Kabul? At the dance, the dance with Alison? With the authorities? Discussion with Frank? 14. Mitch and his video, Allison seeing it, the bombs, the reaction, the guarantee to the Polynesians that there would be no weapons? The ceremony of the blessing of the gate? The general present? 15. Frank, his decision, Allison’s reaction, the launch of the satellite, the visual detail of its success, the staff and their praise, Welch’s satisfaction? Frank stopping the Chinese hackers? His contact with the technician, advising the satellite to be hit, with the cumulative effect of sound and images, its destruction? Staff reaction? Welch’s reaction? 16. The two assistants, the relationship with Frank, friendship, doing their job, reactions? 17. Welch, his confrontation with Frank, explaining that he would simply build a new satellite? 18. The general’s reaction, believing Welch, criticising Frank, bawling him out? The irony of the exposé of the truth and the general relaxed and congratulating Frank? 19. Welch, on the beach, his arrest? 20. Allison and Frank, together, the bond, love, Frank watching Grace doing the hula, her coming to embrace him? 21. Tracy, the letter from Woody, discussing the past with Frank, her love for Woody, his return, the reconciliation? 22. A satisfying blend of the romantic, with the space theme and American security and technology? An optimistic ending?